How can companies effectively measure their company’s risk of a data breach? 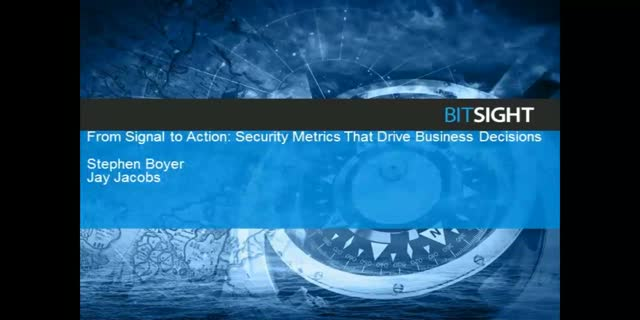 Which security metrics are most important when it comes to determining cyber risk? How do different types of security compromises, whether botnet infections or brand name SSL vulnerabilities, contribute to an organization’s risk profile? In this presentation, BitSight’s Chief Technology Officer Stephen Boyer and Senior Data Scientist Jay Jacobs answer these questions and more. This data-driven webinar will highlight the extensive analysis that the BitSight Data Science team undertakes to make security signals into concrete risk mitigation actions. Perhaps most importantly, the speakers will give guidance on how security and risk professionals at every level - from the board room to the server room - can drive positive change throughout their organizations.